1) Ambient: For overall general illumination such as ceiling fixtures. 2) Task: For specific functions such as reading, sewing or writing. 3) Focal: For accenting a particular area or item such as a sculpture or painting. 1) Desk Lamps with the bottom of the shade about 15” above the working surface will have an even spread of light. If you are right handed, the desk lamp should be placed on the left side and vice versa. 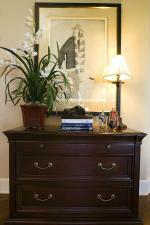 2) Table Lamps should measure no more than 20” higher than the bed to avoid glare. Floor lamp measurement from floor to shade bottom should be 47” to 49”. For reading, place about 10” behind the chair seat. 3) Chandeliers used in a dining room are often the most important decorative, as well as practical accessory. 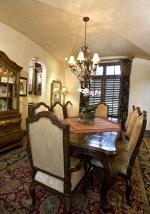 When used over a dining table, the bottom of a chandelier should be at least 30” off the surface. Remember that a chandelier’s size should relate not only to the room but, more importantly, to your table. A radius of approximately 10” should be allowed from the chandelier edge to the table edge, all around. At Doris Younger Designs, our resources include an unlimited selection of lighting styles to complement any design. We have extensive training regarding lighting ideas and techniques and would love to work with you on a lighting plan that would enhance your setting. Contact us to help you bring your space to life.